The value of research is proportional to the breadth, depth, and variety of sources used. 3) an entertaining variety of perspectives in the many areas where disagreement exists. * See bibliographies in each chapter for more complete reference information and for sources not included here. * See links page for related or helpful sites. 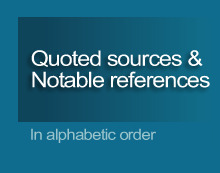 * See Bible list for bibliography of Bibles quoted on this site. This site has documented at least one idea or quotation from everyone listed. I haven't updated this list for several years, so this is probably 30-50 names short. "Why in the world did you quote that person?!"